Treat yourself and a friend to a juicy burger each at Handmade Burger Co for just £10.95. Every patty is handmade and pressed which helps to seal in every ounce of glorious flavour. Go on, take your mate on a date - you both deserve it. Please note the Offer is valid Sunday through Friday, excluding Saturdays. Eligibility Criteria: The promotion is open to members of Priority who are UK residents age 16+. Offer Start and End Dates: Offer is valid from 21/02/19 - 10/03/19. Availability: Subject to availability, while stocks last. Redemption Instructions: To redeem, tap ‘Use now’ and present the code to a member of staff in the restaurant. 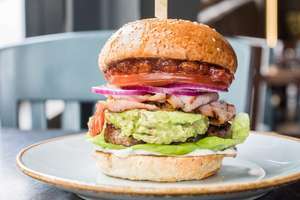 Offer Goods/Services: This Offer entitles you to receive two burgers at Handmade Burger Co for just £10.95. Offer excludes their Headliner range. Offer valid Sunday through Friday, excluding Saturdays. Offer cannot be used in conjunction with any other offer or promotion. The lowest price burgers on your bill will qualify for the discount. One voucher per table, per visit. Menu items subject to change. Subject to availability; please book early to avoid disappointment. These terms and claim instructions incorporate and apply in addition to the Priority App Terms and Conditions, which can be found under Settings in your Priority App. O2’s decision as to Offer allocation is final and no correspondence will be entered into. Applications not complying with these terms and conditions will be invalid. If any provision of these terms and conditions is held invalid by any law, rule, order or regulation of any government, or by the final determination of any court of competent jurisdiction, such invalidity shall not affect the enforceability of any other provisions not held to be invalid. O2 reserves the right to suspend, cancel or amend this promotion and/or review and revise these terms and conditions at any time without giving prior notice and by continuing to take part in the promotion subsequent to any revision of these terms and conditions, participants shall be deemed to have agreed to any such new or amended terms. This Offer is governed by English Law and is subject to the exclusive jurisdiction of the English courts. This Offer is administered by Telefónica UK Limited (O2) and promoted by The Burger Chain Limited. For any concerns about the operation of the offer please contact the promoter. If you no longer wish to receive notifications from Priority, you can turn this feature off in your device settings. Being picky here but: "Please note the Offer is valid Sunday through Friday, excluding Saturdays." Why mention "excluding Saturdays"? Is that for people who can't comprehend what they mean by "Sunday through Friday"? Or why don't they just say "offer not valid on Saturdays"? It's not hard. Being picky here but: "Please note the Offer is valid Sunday through …Being picky here but: "Please note the Offer is valid Sunday through Friday, excluding Saturdays. "Why mention "excluding Saturdays"? Is that for people who can't comprehend what they mean by "Sunday through Friday"? Or why don't they just say "offer not valid on Saturdays"? It's not hard.